Federico Babina is an Italian illustrator who’s previously brought us clever illustrative works like Archisutra and Archidirector. In both series, Babina replaces images of people with personified buildings, and with his new series, Archicards, he adopts this same approach but with a twist. Instead of replacing people with buildings, Archicards replaces the standard images found on playing cards with famous architects throughout history. 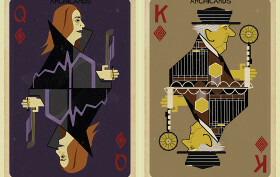 So, the king of hearts is now Corbu, while the king of diamonds is played by Frank Lloyd wright—just to name a few.